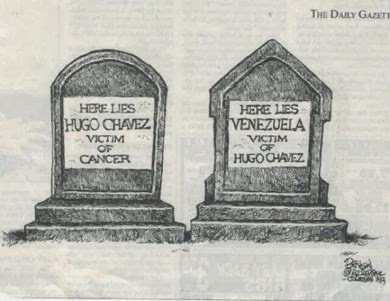 Hugo Chavez and Venezuela ..... This is true!! How Did Venezuela Become So Violent? In the early hours of Monday, Monica Spear became another one of Venezuela's murder victims. The actress and former beauty queen was killed along with her husband during a highway robbery attempt, with her five year old daughter looking on from the back seat of the car as her parents were shot to death. Because of Spear's fame, and the tragic nature of this murder, the story spread rapidly online and on TV, prompting Venezuelan president Nicolas Maduro to call for a special, high-level meeting on the country's security situation. Maduro may be trying to do something about Venezuela's crime problem. 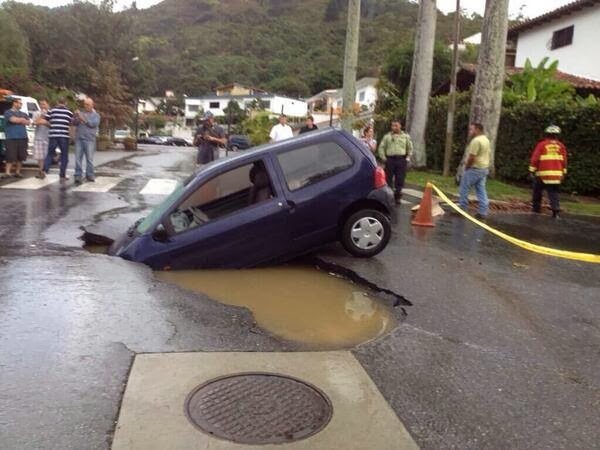 But this incident also highlights an inconvenient truth for the Venezuelan government. Under the socialist government of Hugo Chavez and Nicolas Maduro, Venezuela has become one of the world's most violent countries. The leaders of that country have spectacularly failed to stop the violence. 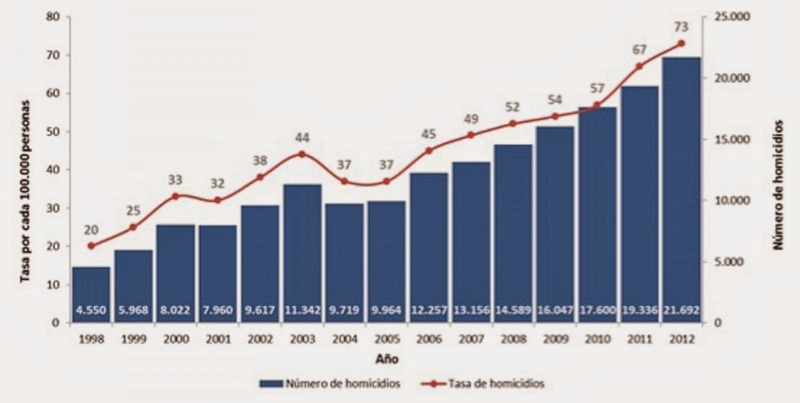 This chart of Venezuela's murder rate was compiled by the Venezuelan Violence Observatory, a local think tank. The red line indicates the number of murders per every 100,000 residents. As you can see, the murder rate in Venezuela has been increasing dramatically since 1999, the year in which Hugo Chavez took office in Venezuela. Murder rates grew through out Hugo Chavez's 13 year tenure, and have continued to climb under that of his successor, Nicolas Maduro. In 2013 Venezuela also had more violent deaths than Iraq, a country plagued by terrorist attacks and sectarian violence. So why has Venezuela become so violent? One of them is that in Venezuela, criminals have little incentive to change their behavior. Think tanks estimate that only 8% of crimes in Venezuela are prosecuted. This means that murderers, robbers and the like, have a 92% chance of breaking the law and getting away with it. Venezuelan criminologist Fermin Marmol, says that the government has not prioritized security policies, like flushing out corrupt cops, and increasing the number of well trained prosecutors. "They have prioritized other things like changing the constitution and exporting the [Bolivarian] revolution," Marmol told Venezuelan newspaper El Universal. The government says it has tried some security initiatives, including sending the military to patrol the most dangerous parts of Venezuelan cities. When Chavez was alive, he argued that high poverty rates in the 1990s led to broken homes, and the abandonment of kids who are now leading lives of crime. But many Latin American countries such as Colombia and Mexico also suffered from high poverty rates in the 1990s, and homicide rates in these places are actually going down now. Some sociologists say that violence in Venezuela is also fueled by class rivalries, which the government promotes in its discourses and TV programs. These analysts argue that by labeling its middle class opponents as "terrorists," "traitors" and "enemies of the state," the government incites violence against these people, giving gangsters from poor neighborhoods a psychological justification for assaulting middle class Venezuelans. The government denies that it is stoking violence. It argues instead that violence is promoted by materialistic TV shows, and action films like Spiderman, which trivialize death. Fermin Marmol says the government has a "contradictory" discourse towards gun control, urging gangsters to give up their weapons, while on the other hand encouraging the formation of socialist militias in poor neighborhoods. He argues that drug trafficking in Venezuelan neighborhoods has increased violence, and claims that a new sort of criminal that is not just looking for goods or money has emerged. According to Marmol, gaining respect is also extremely important to this "new" sort of criminal. These criminals, who are generally teenagers or men in their early twenties, are willing to kill to gain the "respect" of their peers, Marmol says. They will also see any resistance to robbery as an act of "disrespect" towards them that ought to be punished with violence. Quien puede estar tranquilo con la inseguridad que hay en Venezuela? Leave behind their 5 year old daughter who was also injured in the attack. CARACAS – Actress and former Miss Venezuela Monica Spear Mootz and her Irish ex-husband were killed and their 5-year-old daughter was wounded in an armed robbery, authorities said Tuesday. Spear, 29, and her former spouse Thomas Henry Berry, 39, were found dead Monday night on a highway in the central state of Carabobo, the Venezuelan Attorney General’s Office said. The incident occurred when Spear, Berry and their daughter were waiting inside their vehicle while it was sitting on the back of a tow truck, after "a sharp object that had been placed on the highway" punctured their tires, according to the director of the Venezuela's investigative police. The tow truck driver and his assistant ran off when they saw the assailants approaching, but Spear and her husband and child took refuge in the car, locking the doors. The robbers fired 6 shots into the car when they refused to open the doors. Police say they have arrested five people so far, with two of them just 15 and 16. Based in Miami, where Spear worked for U.S. television network Telemundo, the family was in Venezuela for a vacation, visiting family and friends. Spear, proud of the beauty of her native Venezuela, was showing her daughter around Venezuela with her ex-husband, according to friends and her twitter and instagram posts. Spear was born in 1984 in Maracaibo, won the Miss Venezuela beauty pageant in 2004 and the next year participated in the Miss Universe pageant in Thailand, where she came in fourth. Berry, who's father was a professor at the country's most elite university, Simon Bolivar University, owned a travel agency. Venezuela is one of the world’s most violent countries. Last week, Interior Minister Miguel Rodriguez claimed that there were 39 murders per year per 100,000 inhabitants. Non-governmental organizations say that the government -- which stopped reporting statistics -- under-reports the figure and that it is actually closer to 100 murders per 100,000. According to the non-governmental organization Venezuelan Violence Observatory (VVO), there were 21,692 homicides in Venezuela in 2012, amounting to a rate of 73 homicides per 100,000 inhabitants, among the highest in the world. In Caracas, the homicide rate is even higher at 122 homicides per 100,000 inhabitants. With almost 28,000 murders in 2013, Venezuela is now considered one of the most dangerous countries in the world, despite government attempts to crack down on crime. On Monday former Miss Venezuela Monica Spear, 29, and her ex-husband Thomas Henry Berry were gunned down in front of their five-year-old daughter in a roadside robbery in Venezuela. Ms Spear, who lived in Florida, was on holiday when the incident happened. Their five year old daughter was shot in the leg but survived. The shooting was one of the latest high-profile incidents in a country where killings are common in armed robberies. On Wednesday hundreds of Venezuelans gathered in the capital Caracas to protest against the wave of violence. Among them the actress Elba Escobar, who called on the government to act: "The power to solve this is with them. They have to do it. They have to do it now." "Enough of coming onto the street in fear for your life, enough of knowing that our neighbour was killed, that our cousin was killed, that a friend who had not yet reached 30 and was just going about as a tourist with a five-year-old baby was killed and that her daughter was wounded on a highway." Violent crime soared during the 14-year rule of Hugo Chavez, who died of cancer in 2013. In 2013, President Nicolas Maduro rolled out a security plan dubbed "Patria Segura," which included mobilizing the military alongside the national police to fight crime. Mr Maduro sent some 3,000 troops into the streets of the capital of Caracas to crack down on rampant crime that has made the OPEC nation one of the most dangerous in the world. The plan was an effort to lower violent crime following close to 20 similar attempts during the 14-year rule of late socialist leader Chavez. One prominent human rights group however criticized the plan on the grounds that the military is trained to fight wars and to control public order, not to prevent crime. Official figures showed that more than 16,000 people were killed in Venezuela in 2012, an increase of 14 percent from the year before and a murder rate of 55.2 per 100,000 inhabitants, one of the highest in the world. 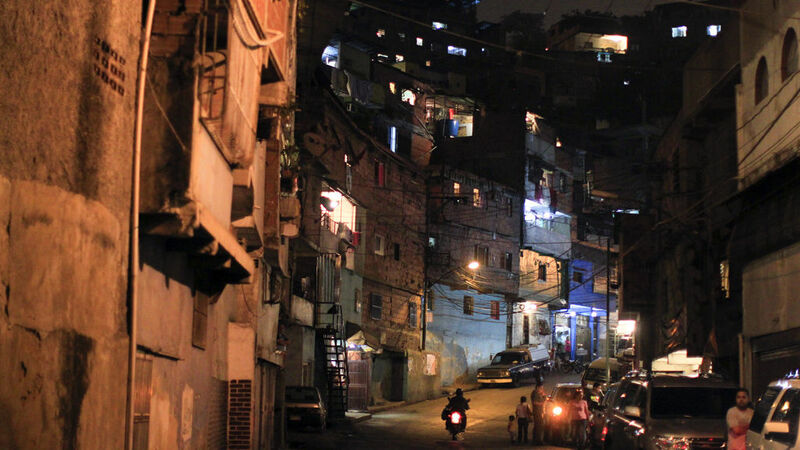 The country has one of the world's highest murder rates — the United Nations has ranked it 5th globally - and violent crime is so rampant that Venezuelans tend to stay home after dark. According to the non-profit Venezuelan Observatory of Violence, the oil-rich South American country's murder rate was 79 per 100-thousand inhabitants in 2013, although government statistics put the rate lower. The non-profit group said 95 percent of murders go unsolved. Venezuelans, despite being plagued by shortages of food and other goods, list crime as their most pressing worry. According to the non-profit website InSight Crime, the crime rate in Venezuela is even higher than Colombia, which is still in the midst of a civil conflict. InSight Crime said that causes of gun crime include high levels of corruption, a lack of investment in the police force and weak gun control – all of which has led to a proliferation of arms and a lack of coherent security policy. It also said that Venezuela has become a principal transit nation for Colombian cocaine. The United Nations Office on Drugs and Crime said Venezuela does not produce sizeable quantities of cocaine, but it has become a transit country for cocaine from Colombia, Peru, and Bolivia, which is shipped to the United States and Europe. Inflation in Venezuela is also soaring, the currency is losing value on the black market, and foreign currency reserves are dwindling. Even Venezuela's once vaunted energy sector, crippled by lack of investment, is failing to generate enough revenue to subsidize domestic giveaways. Economists say shortages of some consumer products in Venezuela stem from price controls that are meant to make basic goods available to the poorest, along with restrictions on foreign currency. President Maduro claims anti-government forces, including the private sector, are causing the shortages to destabilise the country.